The St. Louis Cardinals have successfully moved on to their fourth World Series since 2004–the most of any team in the MLB. They will face off against the Boston Red Sox–the team that swept them in the 2004 Fall Classic. It all starts on Wednesday at 7:07 PM CST on FOX (thank goodness!) with Joe Buck and Tim McCarver behind the mic’s. 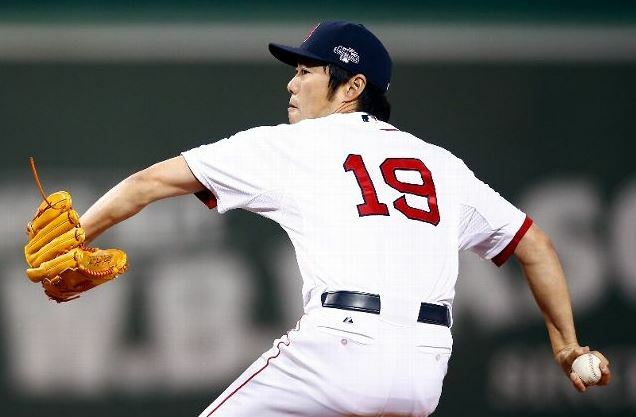 Well, with a couple of days before the series commences, I decided to break down one of Boston’s biggest weapons–their closer, Koji Uehara. His 2013 statistics speak for themselves. In 73 regular season appearances, he had 74.1 innings pitched with a 1.09 ERA. He allowed just 33 hits all season while recording 101 strikeouts to just 9 walks for an incredible 11.2 to 1 strikeout-to-walk ratio. This dominance has continued so far in the post-season where he has 9.0 innings pitched and a 1.00 ERA. He has recorded 13 strikeouts and has yet to walk a batter. Before I get into that game, I will give you an overall breakdown of his repertoire and his tendencies throughout 2013. Uehara relies heavily on his four-seam fastball and his devastating splitter. 57% of his pitches were four-seam fastballs and 37% were splitters. He also has a cutter and curveball, but these two combined accounted for only 6% of his pitches. Like almost every pitcher, he likes to start hitters off with his fastball to get ahead in the count. 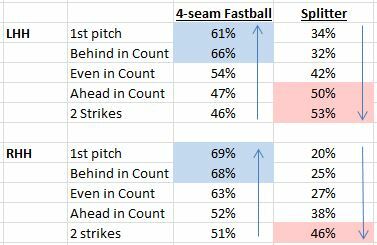 Once ahead in the count, it is basically a “coin-flip” as to what pitch he will throw since he goes to both his fastball and splitter around 50% of the time. This is where Uehara excels. It is almost impossible to distinguish between these two pitches as a hitter. The release point is virtually the same, and by the time the hitter picks up the spin, it is already too late. This is a problem for hitters considering the fastball averages 89 MPH while the splitter comes in 8 MPH slower at 81 MPH. This deception led to a 24.76% whiff rate on his splitter this season. I guess it helps that his splitter averages 7.46 inches of tailing action as well–nasty! Uehara’s approach is nothing like that of Cardinal closer, Trevor Rosenthal. Both have fantastic control and have high strikeout rates, but the ways they get their strikeouts are much different. Rosenthal relies on his overpowering heater while Uehara utilizes the devastating movement on both his fastball and his splitter. It took a mere 11 pitches–all strikes–for Uehara to close out Game 2 of the ALDS against the Tampa Bay Rays. He set them down in order–strikeout-strikeout-ground out. He threw five fastballs that averaged 90.3 MPH with 8.15 inches of movement. He threw six splitters–averaging 82.5 MPH with an incredible 9.21 inches of horizontal movement. The first two hitters, Matt Joyce and Jose Lobaton, struck out on just six total pitches–that’s about as efficient as it gets. There are two important things to note about this graph. As you can recall, I said that all 11 of his pitches were strikes. Well, it appears that only four of his pitches actually ended up in the strike zone. This is a direct testament to the movement of each of his pitches that I noted earlier in this post. The second thing to note is that not a single pitch was thrown near the middle of the plate. 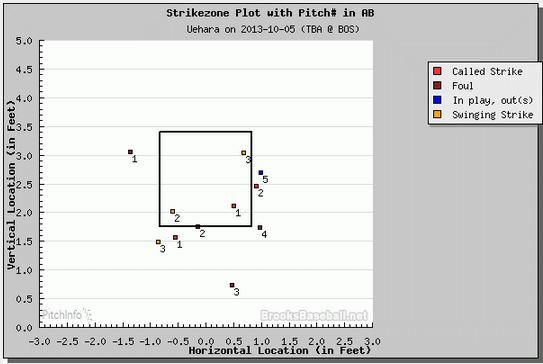 Uehara’s impeccable control allows him to live on the corners and down in the zone. I know I am a Cardinal blogger, but I still think fans should have the opportunity to know a little bit about their opponents as well. Hence, why I wrote a post on Gerrit Cole in the NLDS and then another one on Clayton Kershaw in the NLCS. Also, I respect good pitching when I see it, and Uehara is one of the best in the business right now–as shown by his statistics and his repertoire. In short, it is in the Cardinals best interest to make Uehara a non-factor in the series. The only way they can do this is by getting ahead and staying ahead. I never believe in the game being over until the final out has been recorded, but if the Cardinals are down in the ninth inning this series, it will be extremely difficult to mount a comeback. This entry was posted in St. Louis Cardinals, United Cardinal Bloggers, World Series and tagged Boston Red Sox, Koji, Koji Uehara, St. Louis Cardinals, World Series by stlcupofjoe. Bookmark the permalink.